I can’t believe it took me 10 years of working at Oxfam to get what gender justice really means—to understand it on a gut level, and not just intellectually. But I do now, and it’s thanks to a woman I met a few weeks ago in Haiti: Olimcia Morolus. In a small community in Liancourt, we were making our way down a dirt road—Avenue Chemin de Fer, said a sign at the corner, a reference to the railroad tracks that once connected this place to cities beyond—when we came to the home of Morolus. She’s a member of MAFLPV, or the Mouvement d’Aide aux Femmes Liancourt-Payan de la Commune de Verrettes, one of the local women’s organizations Oxfam works with in Haiti. 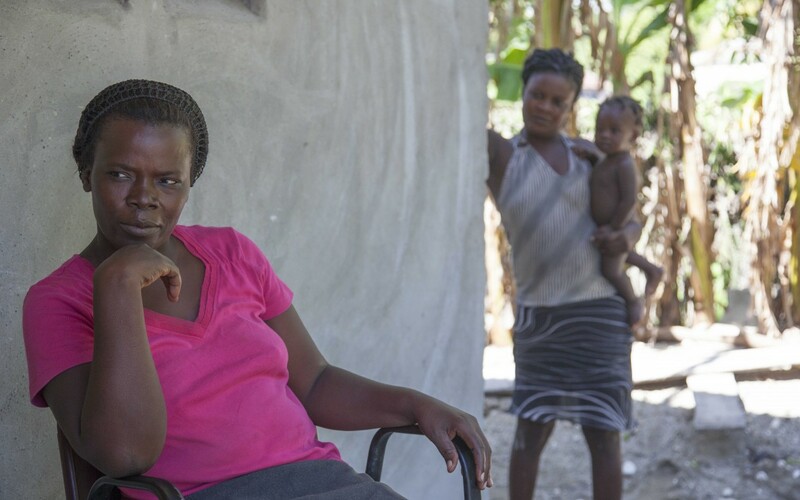 Morolus was on her porch, with a handful of other women, so we stopped in to talk about rice: the lifeblood of many communities in the Artibonite Valley, which produces about two-thirds of all rice grown in the country. With the help of MAFLPV, Oxfam is promoting a more efficient rice cultivation method here, one that requires fewer seeds, water, and fertilizer while producing more bountiful harvests than traditional methods. Some farmers say they have seen their yields increase dramatically. But it wasn’t the system of rice intensification, that Morolus wanted to talk about most, nor the fact that it helped increase her harvest by a third. No. There was something else, something even more important than her livelihood: her empowerment. “I’m really proud of all this training,” she said, referring to her new knowledge about rice. But clapping her hands and raising her voice she suddenly switched gears. “The biggest, most important training we got was gender,” said Morolus, who used to be afraid to work with men, afraid of the sexual harassment she would encounter, and of the discrimination so many women endure. Gender justice is a big part of Oxfam’s anti-poverty efforts. We talk about it a lot, how the needs of women are different from those of men, how women bear the brunt of poverty, how their limited access to education, resources, and political engagement stymies their futures. That’s why Oxfam aims to transform power relations between women and men, facilitating women’s ability to use their own voices and set their own agendas. The belief in gender justice also drives broader efforts like this month’s 16 Days Campaign, which works to end gender-based violence around the world—an effort that Oxfam also supports in Central America and elsewhere. But I didn’t really appreciate the power of all of this until that hot morning in October in Haiti’s Artibonite Valley. I thought about the MAFLPV compound as we had left it close to dusk the day before—a place that women seem to be able to call their own. Some had gathered outside the kitchen to prepare food for an event the next day. Another played with a young child. Laughter and quiet talk had filled the air and a soft breeze rattled the dry stalks of corn planted in a small garden. A slice of heaven, I thought, and a place where women can be themselves. What did Morolus learn among this sisterhood that gave her so much courage? Your donation has the power to help change lives. Give today. Give today and bring hope to families facing poverty.